The implementation of ABS in many resource-poor countries is plagued with challenges.,,,,,, A strategy that could ameliorate these challenges is the concept of “antibiotics drug pooling (DP).” Antibiotic DP requires all in-patients on antibiotics to contribute their procured antibiotics toward a common stock and have their treatment administered from this source. This will hasten the commencement of antibiotic treatment, facilitate easy switch from one antibiotic treatment to another, and reduce waste. Notwithstanding the potentials of DP, it is still an untested ideology, which requires the support of parents/caregivers and health-care workers (HCWs) in order to succeed. This study, therefore, seeks to determine the feasibility of antibiotic DP among pediatric in-patient in southeast Nigeria, as well as solicit suggestion that can ease its adoption. It is our belief that the findings will contribute to improve ABS practices in these resource-poor countries. The study was cross-sectional in design with both quantitative and qualitative aspects. The qualitative aspect of the study involved doctors, nurses, and pharmacists of all cadres who were randomly selected from workers in the pediatric ward and parents/caregivers of in-patient children receiving antibiotic treatment who expressed willingness to participate in the study. The secondary data were generated from the review of the medical records of children on admission. Permission to review the medical records of children on admission was obtained from the Head of Medical Records Department. Information that could be traced to any patient were excluded from the review. Qualitative data were collected using 3 focus group discussions (FGDs) for caregivers and 16 in-depth interviews (IDIs) with HCWs. Different interviewer's guides were used for IDIs and FGDs. The FGD guide was translated to the local language (Igbo) and reviewed by native speaker for better comprehension. The Igbo version was translated back to English to ensure that the original meaning was not lost. The guides were designed to obtain information on HCWs' use of antibiotics, challenges encountered in rendering services, and possible solutions to those problems. A descriptive summary of the concept of DP was provided in an interactive manner to the respondents. The IDIs: Participants for IDI include doctors, nurses, and pharmacists. Three to four doctors, one nurse, and one pharmacist that were identified in the pediatric ward were selected through random sampling irrespective of their administrative roles in the department. Information sheets were provided for them prior to the commencement of the interviews. Sixteen IDIs were conducted in total. Their experiences with antibiotic use, challenges, and solutions were discussed. The concept of DP was introduced and suggestions were made. One FGD was conducted in each of the selected facilities and each FGD involved 8–10 caregivers. Each group consisted of both male and female caregivers. The decision to combine both genders in one group was born out of the fact that the proportion of fathers who care for their children in the hospital while on admission was few and could not form a proper group. Biodata forms were filled and signed by the participants before commencing each of the FGDs. The biodata form contained a brief description of the study, and space to fill-in their age, gender, occupation, place of residency, as well as provision for signing of consent. Thereafter, each participant was assigned a number, which had to be mentioned before responding to any question. This was for easy linkage of responses to the responder and to enable the quantitative analysis of certain responses. During the course of the interview, effort was made to ensure that each participant contributed in the discussion by routinely calling out their assigned numbers to prompt comment. However, for some direct questions, such as willingness to contribute and participate in DP if implemented and the feasibility of DP, they were called upon individually to respond to the question. Quantitative data were collected from the medical records of patients on admission. A profoma was filled from the information obtained from the patients' folders. The data collected were whether antibiotic was prescribed, which antibiotic was prescribed, how many antibiotics were prescribed, the dosage prescribed, was there documented laboratory result before commencement of antibiotic therapy, and any change in prescribed antibiotic within 72 h it was commenced. Data analysis: The audio recordings of the IDIs and FGDs were transcribed verbatim into Microsoft Word documents (Microsoft Redmond, Redmond, WA) for analysis. To ensure transcription quality, all transcripts were independently checked against the original audio recordings and grammar errors corrected. The transcripts were anonymized. The qualitative data from IDIs and FGD were analyzed separately. Since IDI was used exclusively for the HCWs and FGD used for caregivers, the guides used for both interviews were structured to achieve the set objectives: feasibility of DP and willingness to contribute to the drug pool. Coding of transcripts was performed by two independent persons to ensure consensus resolution of inconsistences. Identified thematic headings, such as knowledge of DP, willingness to contribute to the drug pool, feasibility of DP, and suggestions on how to improve the concept, were used to develop the parent nodes and child nodes imported into NVivo software (QSR International, Melbourne, Australia). The information extracted through the coding framework was then analyzed. Frequency and percentages were calculated for few of the direct questions using the proportion of individual responses to each of the question. The Health Research and Ethics Committee of University of Nigeria Teaching Hospital Ituku-Ozalla gave the ethical approval before the study was commenced. The ethical approval was thereafter used to obtain permission from the other institutions. Written consent was obtained from the participants before participation in the study. Approval was also obtained from the Chief Medical Record Officer before access was given to the medical records of the subjects. Overall, 53 folders of patients on admission on the day of interview were reviewed; out of these, 45 (84.2%) received parenteral antibiotics, and in all cases (100%), the initial antimicrobials were prescribed empirically without any microbiological evidence. Majority (82.2%) were on a monotherapy regimen. Of those on antibiotics, 17 (37.8%) had their antibiotics changed within the first 72 h; it was commencing treatment [Table 1]]. Of the antibiotics prescribed: cephalosporin was the most (62.2%) frequently prescribed, followed by penicillin-based antibiotics (17.8%). The mean cost for a 48-h antibiotic treatment regimen was USD 36.3. All the respondents considered antibiotic use among children to be a common practice. 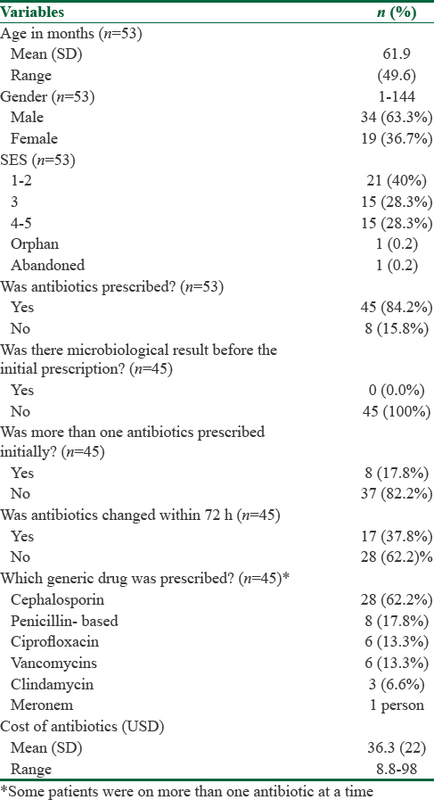 In their response to the question, “Do you experience challenges in the use of antibiotic in pediatric practice?”, the respondents attested that there are several challenges experienced with antibiotic use, especially prescribing on empirical bases. The study revealed that majority of the respondents viewed the antibiotic DP concept as not being feasible. Their major concerns were on issues like (a) lack of transparency, (b) inequity and unfairness in contributions, (c) caregivers unwillingness to relinquish their procured drugs to the pool, (d) caregivers withholding contribution once their children have started receiving treatment, and (e) the fear of others contributing fake or substandard drugs to the pool. All the respondents accepted that the DP concept will ease the burden of antibiotics cost, improve availability, and reduce antibiotic wastage. However, for these benefits to be achievable, the concept needs to be refined and modified in line with the identified challenges. Several suggestions were made on how to do this. On ways to improve caregivers' willingness to contribute and share antibiotics, the key suggestions made were (a) that the hospital pharmacy should be involved in the administration and management of the DP system, and (b) there should be a standardized prescription pattern for antibiotics use based on approved guidelines. The former will restrict the choice of empirical antibiotics to a stipulated few, based on the spectrum of activity and cost. This ensures that the pediatric ward pharmacy stocks these antibiotics for the empirical treatment of most suggested infection cases for the critical first 72 h of admission. This will be supported by routine audit and feedbacks, as well as case reviews by an independent expert, different from the treating team, to advise on the suitability of these antibiotics.,, The aim will be to ensure replenishment of hospital stock of the commonly prescribed antibiotics to facilitate the prompt commencement of treatment. Furthermore, in a situation where the empirical antibiotic is changed within 72 h of commencement, the newly prescribed antibiotics will be easily obtained from the emergency stock, thereby saving caregivers the stress of buying from external sources. Second, the adoption of a standardized prescription pattern for antibiotic involves a first 72 h antibiotic billing policy. The proposed policy will cover the cost of antibiotic treatment, irrespective of type of antibiotic prescribed, so long it is among the selected broad-spectrum antibiotics outlined for use for empirical treatment. This will be based on the pre-calculated average cost of the antibiotics used in the first 72 h, weighted according to age and weight. The benefit this has is that it will transfer the responsibility of providing the antibiotics to the prescriber and downplay the power the caregivers have over their antibiotics. In this study, the proportion that received cephalosporin was high compared to those that received penicillin and ciprofloxacin. This is similar to the finding of Di Pietro et al. but in contrast with that of Buccellato et al. The high use of antibiotics irrespective of the type could be attributed to parental pressure to receive antibiotic. Furthermore, the observed relatively wide range in cost obtained could be due to multiplicity of antibiotic options available for treatment common pediatric illnesses. Adherence to a specified guideline could reduce this. However, before implementing the first 72 h billing policy, a review of antibiotic prescription pattern and adopt treatment guideline for common pediatric infectious diseases needs to be performed. Effort should be made to promote the use of effective antibiotic generics and brands for further reducing the cost of antibiotic therapy. The proposed “ first 72 h billing” policy may be combined with a unit-dose dispensing scheme (UDDS) to ensure that patients can get a refund for any drugs not used in case of drug discontinuation before the 72-h window elapses. Furthermore, the transfer of the custody of the antibiotics to the prescriber through the average billing will facilitate the implementation of DP. This ensures that no more than one vial of similar antibiotics is opened at a time, irrespective of the number of patients on it. This has the advantage of preventing waste that could have occurred when individual patients reconstitute their antibiotics. It will equally enhance the smooth transition from one antibiotic to another or discontinuation within the first 72 h. This will indirectly save the cost of transportation and the intangible cost of time and anxiety involved to procure the drugs, as well as reduce the risk of buying substandard antibiotics. The current decentralization of pharmacies to the wards and clinics obtainable in most tertiary hospitals will make implementation of this policy feasible. The major benefit of combining 72 h billing and UDDS is that it will offer an opportunity to monitor drug use and cost, thereby facilitating accountability and transparency. Although the aforementioned objectives are laudable, they are not without challenges. Determining the choice of antibiotic, which is likely to vary among the HCWs, is a major problem, further compounded by the potential pressure from the pharmaceutical companies. However, this can be ameliorated by the use of a review committee who decides on both antibiotic generic and brands, based on sensitivity and observed response pattern. Another challenge is the possible resistant from the pharmacy with regards to restrictions on the choice of antibiotic to stock, particularly when one considers the fact that most units in the tertiary hospitals are profit-centered. This will require extensive advocacy and deliberation for the proposed policy to be accepted. Finally, the implementation of this policy requires extensive monitoring and cataloging, and it is doubtful whether the needed manpower with the requisite knowledge and experience exists in the health institutions. The nonextension of the study to outpatients and preventive care (immunization clinics) is a limitation. This denied the opportunity of sampling the opinion of caregivers of children who are not at immediate need of admission. Bias may arise when in-patient pediatric caregivers' responses are influenced by fears that their suggestions are likely to be implemented in their children's care. Therefore, involvement of outpatient caregivers may have provided a more balanced view. The unavailability of studies on drug pooling is another limitation in this study. Although this can be attributed to the related newness of the concept of DP, it is hoped that with the increased awareness of ABS, the future prospect for similar studies has been improved. This study revealed that the implementation of the concept of DP as proposed is not feasible. It may be possible to implement if some of the suggested modifications are made: (1) the adoption of a harmonized prescription pattern (prior authorization) and billing; (2) implementation of unit-dose dispensing of antibiotics for the first 72 h.
Graber CJ, Jones MM, Glassman PA, Weir C, Butler J, Nechodum K, et al. Taking an antibiotic time-out: Utilization and usability of a self-stewardship time-out program for renewal of vancomycin and piperacillin-tazobactam. Hosp Pharm 2015;50:1011-24. Tamma PD, Cosgrove SE. Antimicrobial stewardship. Infect Dis Clin North Am 2011;25:245-60.
WHO. The Rational Use of Drugs—Report of the Conference of Experts, Nairobi November 25-29, 1985. Ashiru-Oredope D, Sharland M, Charani E, McNulty C, Cooke J; ARHAI Antimicrobial Stewardship Group. Improving the quality of antibiotic prescribing in the NHS by developing a new Antimicrobial Stewardship programme: Start smart--then focus. J Antimicrob Chemother 2012;67(Suppl 1):i51-63. Ali AA, Thorbecke E. The state and path of poverty in Sub-Saharan Africa: Some preliminary results. J Afr Econ 2000;9:9-40. World Bank. World Development Indicators. Washington DC: World Bank; 2013. data.worldbank.org. Okpani AI, Abimbola S. Operationalizing universal health coverage in Nigeria through social health insurance. Niger Med J 2015;56:305-10. World Health Organization. Global Health Observatory Data Repository. WHO; Geneva. 2015. Available from: http://www.apps. who.int/gho/data/node.country.country-NGA. [Last accessed on 2015 Mar 09]. Moyo K, Porter C, Chilima B, Mwenda R, Kabue M, Zungu L, et al. Use of laboratory test results in patient management by clinicians in Malawi. Afr L Lab Med 2016;4:a277. doi:https//doi.org/10.4102/ajlm.v4i1.277. Available from: www.ncbi.nlm.nih.gov. [Last accessed on 2018 Mar 06]. Elias B, Soares C. Quality of medical laboratory services in resource limited settings. Afr J Infect Dis 2012;6:10-1. Blood Tests and Point of Care diagnostics. Available from: www.ebe.co.uk/article/clinical. Oyibo PG. Out-of-pocket payment for health services: Constraints and implications for government employees in Abakaliki, Ebonyi State, South East Nigeria. Afr Health Sci 2011;11:481-5. Onwujekwe OE, Uzochukwu BS, Obikeze EN, Okoronkwo I, Ochonma OG, Onoka CA, et al. Investigating determinants of out-pocket spending and strategies for coping with payments for healthcare in southeast Nigeria. BMC Health Serv Res 2010;10:67. Dancer SJ, Kirkpatrick P, Corcoran DS, Christison F, Farmer D, Robertson C. Approaching zero: Temporal effects of a restrictive antibiotic policy on hospital-acquired Clostridium difficile, extended-spectrum beta-lactamase-producing coliforms and meticillin-resistant Staphylococcus aureus. Int J Antimicrob Agents 2013;41:137-42. DiazGranados CA. Prospective audit for antimicrobial stewardship in intensive care: Impact on resistance and clinical outcomes. Am J Infection Control 2012;40:526-9. Di Pentima MC, Chan S. Impact of antimicrobial stewardship program on vancomycin use in a pediatric teaching hospital. Pediatr Infect Dis J 2010;29:707-11. Spivak ES, Cosgrove SE, Srinivasan A. Measuring Appropriate Antibiotic Antimicrobial Use: Attempt at opening the Black Box. Clinical Infectious Diseases 2016,63:1639-44. Di Pietro P, Alberighi OD, Silvestri M, Tosca MA, Ruocco A, Conforti G, et al. Monitoring adherence to guidelines of antibiotic use in pediatric pneumonia: The MAREA study. Ital J Pediatr 2017;43:113. Buccellato E, Melis M, Biagi C, Donati M, Motola D, Vaccheri A. Use of antibiotics in Pediatrics: 8-Years survey in Italian hospitals. PLoS One 2015;10:e0139097. Andrews T, Thompson M, Buckley DI, Heneghan C, Deyo R, Redmond N, et al. Interventions to influence consulting and antibiotic use for acure respiratory tract infections in children: A systematic review and meta-analysis. PLoS One 2012;7:e30334.